Ht / Wt: 6'0" / 195 lb. 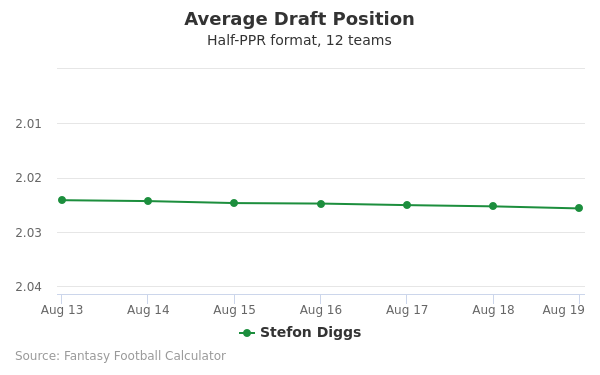 Stefon Diggs's fantasy value is measured by his average draft position (ADP) in fantasy football mock drafts. 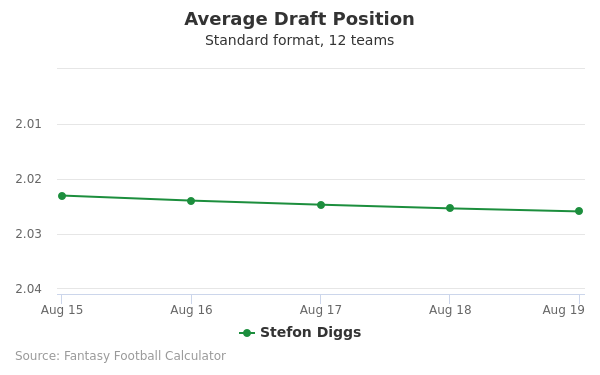 In recent drafts, Diggs's current ADP is 4.02, which indicates that his fantasy outlook is to be the 2nd pick of the 4th round, and 37th selection overall. 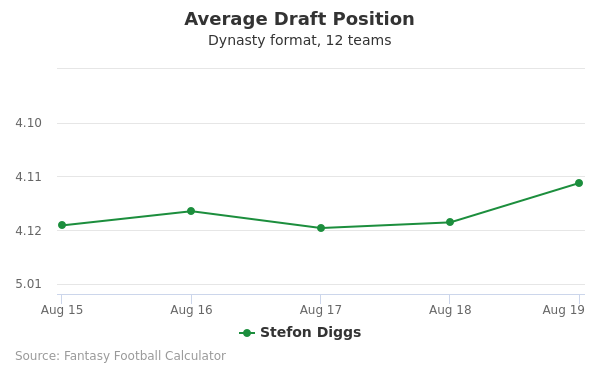 The code below will display a graph that updates every day to show the ADP data for Stefon Diggs for the past 30 days in 12-team PPR leagues. Draft Devonta Freeman or Stefon Diggs? Draft Aaron Rodgers or Stefon Diggs? Draft Chris Carson or Stefon Diggs? Draft Brandin Cooks or Stefon Diggs? Draft Derrius Guice or Stefon Diggs? Draft Kenny Golladay or Stefon Diggs? Draft Andrew Luck or Stefon Diggs? Draft Kerryon Johnson or Stefon Diggs? Draft Cooper Kupp or Stefon Diggs? 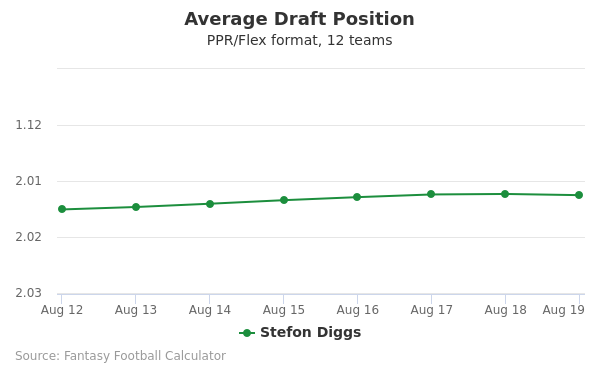 Draft Eric Ebron or Stefon Diggs? Draft Robert Woods or Stefon Diggs? Draft Julian Edelman or Stefon Diggs? Draft Stefon Diggs or Tarik Cohen? Draft Baker Mayfield or Stefon Diggs? Draft Jarvis Landry or Stefon Diggs? Draft O.J. Howard or Stefon Diggs? Draft Alshon Jeffery or Stefon Diggs? Draft Stefon Diggs or Tyler Boyd? Draft Stefon Diggs or Tevin Coleman? Draft Kenyan Drake or Stefon Diggs? Draft Stefon Diggs or Will Fuller? Draft Deshaun Watson or Stefon Diggs? Draft Chris Godwin or Stefon Diggs? Draft Evan Engram or Stefon Diggs? Draft James White or Stefon Diggs? Start Devonta Freeman or Stefon Diggs? Start Aaron Rodgers or Stefon Diggs? Start Chris Carson or Stefon Diggs? Start Brandin Cooks or Stefon Diggs? Start Derrius Guice or Stefon Diggs? Start Kenny Golladay or Stefon Diggs? Start Andrew Luck or Stefon Diggs? Start Kerryon Johnson or Stefon Diggs? Start Cooper Kupp or Stefon Diggs? Start Eric Ebron or Stefon Diggs? Start Robert Woods or Stefon Diggs? Start Julian Edelman or Stefon Diggs? Start Stefon Diggs or Tarik Cohen? Start Baker Mayfield or Stefon Diggs? Start Jarvis Landry or Stefon Diggs? Start O.J. Howard or Stefon Diggs? Start Alshon Jeffery or Stefon Diggs? Start Stefon Diggs or Tyler Boyd? Start Stefon Diggs or Tevin Coleman? Start Kenyan Drake or Stefon Diggs? Start Stefon Diggs or Will Fuller? Start Deshaun Watson or Stefon Diggs? Start Chris Godwin or Stefon Diggs? Start Evan Engram or Stefon Diggs? Start James White or Stefon Diggs? Stefon Diggs is an American professional football player who was drafted by the Minnesota Vikings in the official NFL Draft for the National Football League (NFL). He is a wide receiver for the Minnesota Vikings who are based in Minneapolis, MN. Diggs was drafted in the 5th round, 146th overall in 2015. Diggs played for and attended Our Lady of Good Counsel High School in Maryland. The school is located in Montgomery County. Diggs also ran track and and was awarded many athletic accolades for his performance in sports. He racked up 810 yards for receiving in 2010. That same year, he also recorded 23 touchdowns. He was a junior in high school at the time. His senior year, Diggs collected 770 yards with 8 touchdowns. He also had 277 rushing yards. He was runner up for Gatorade Maryland Player of the Year, All-metro selection from the Washington Post and All-County by the Montgomery Gazette. Another notable achievement was being named Most Valuable Player (MVP) of the U.S. Army All-American Junior Combine in 2011. A year later, he was invited to play in the 2012 U.S. Army All-American Bowl. Diggs attended college at Maryland and his many highlights include playing as a wide receiver on special teams and ranking second and eighth in the American and National conferences respectively. Diggs broke a number of college football records including the second most all-purpose yards in a single season. Diggs has a 35-inch vertical, according to sources like MockDraftTable. His broad jump is 115 inches and his hand size is ten inches. This makes him an agile and powerful NFL player with a contract for the Vikings. In January 2016, Diggs was named to the Pro Football Writers of America's 2015 NFL All-Rookie Team. Diggs' 40 time is also impressive, coming in around 4.4, which is extremely fast. According to Spotrac.com, his salary is in the low single millions: he signed a 4-year, $2,507,713 contract with the Vikings. There were also several bonuses and endorsements. Diggs promotes himself, his team, his endorsements and his good service to the community of the Twin Cities on social media, including his Twitter account. His latest Tweets have included retweets from sports media channels discussing Diggs' career as well as his shopping experiences with Amazon Prime. His Twitter handle is @stefondiggs. Diggs is in his second season with the NFL, going on the third. He has only played for the Vikings. He has had 7 career touchdowns, more than 1,600 yards, an average of almost 12 yards per game and 26 yards rushing, according to the Official Minnesota Vikings website. Diggs' player number for the Vikings is 14. He was born in Alexandria, VA in 1993. His birthday is November 29. He is six feet tall and weighs just under 200 lbs. He was once suspended in a game against Penn State, but he has had little negative controversy in the NFL.